Interactive, fun, engaging, and unique in-store user experiences are what draw shoppers in and keep them coming back. Having mastered the art of what makes customers excited, Outform has a solid process which helps us create promotion, awareness, and engagement for brands while transforming in-store shopper interactions into product purchase considerations and creating consumer loyalty. Our multi-step process helps us create one whole, effective, successful solution. Let’s take a look at our work with Jawbone as an example. The UP by Jawbone fitness tracking system is a revolutionary way for people to monitor their health and stay on a healthy track. The system offers users many benefits including monitoring of sleep, diet, and activity as well as personalized tips and reminders to help them meet their fitness goals. The goal was to have the Jawbone brand as well as the UP’s amazing benefits stand out to shoppers in stores. ..In fact, there were several. In the ever-growing fitness tracker industry people face confusion when trying to pick a band. With so many brand son the market it becomes hard for customers to differentiate amongst them all and pick the one that perfectly suits their lifestyle. Some people don’t even know what a fitness tracker is or does – features like food logging and calorie counting could mean absolutely nothing to them. Even if some do know what an activity tracker they don’t always see the need for it in their life. Our job at Outform was to convince these different sets of people that an UP activity tracker is for them no matter what their lifestyle is. And it’s the truth – an UP tracker can benefit anyone whether they exercise regularly or rarely. We were then faced with the challenge of coming up with an idea for a retail display which houses the answers to these problems. We worked closely with our creative team to create a display that implemented the strategy we had come up with and combined it with a beautiful design which is not only innovative, but comes in different sets of tiers from low-end to high-end. 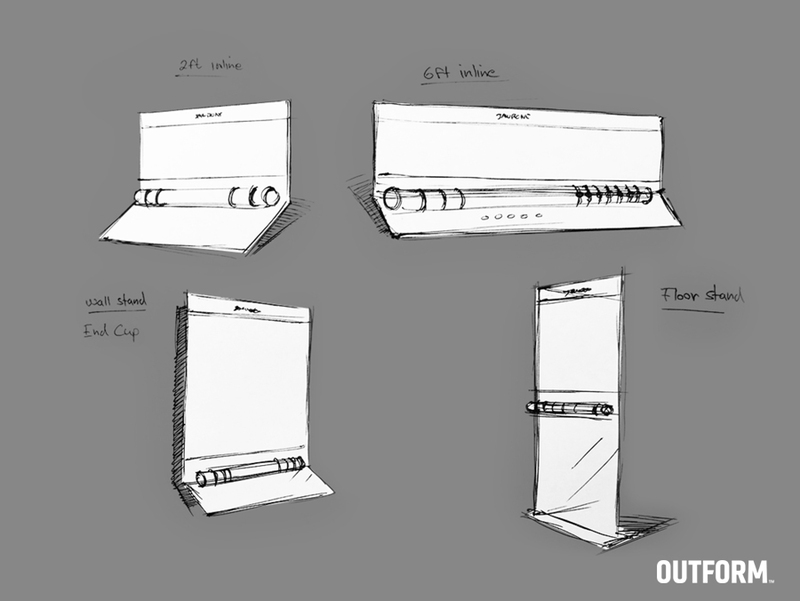 The end result was a unique design which features an upright screen that would immediately make the UP by Jawbone display a standout amongst competitors on stores shelves. 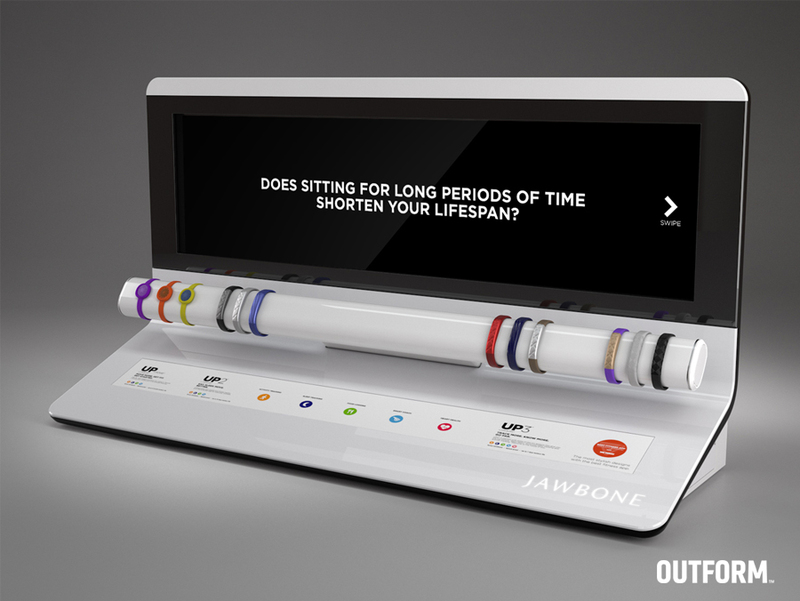 Additionally, the intriguing questions featured on the screen add an attention-grabbing component for shoppers, giving them an interesting way of finding out about the features and benefits of the Up by Jawbone system. The clean color palette gives the display a beautiful appealing look. The fitness bands add pops of color to the unit, arranged accordingly to let users differentiate between the various models so they can easily identify the perfect band for them. The next step was to produce the displays and ship them out to the retailers so the world can enjoy the UP by Jawbone fitness trackers. After the displays were in stores, our observation team went out to different locations to see how the display was performing. 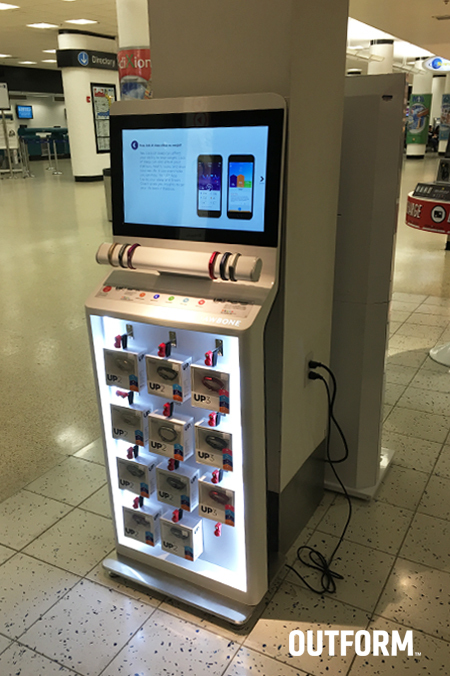 The team spoke with customers and employees to get insights on in-store user interaction and to understand the success of the display, including how often customers interacted with it and which features worked best to covert users into customers. 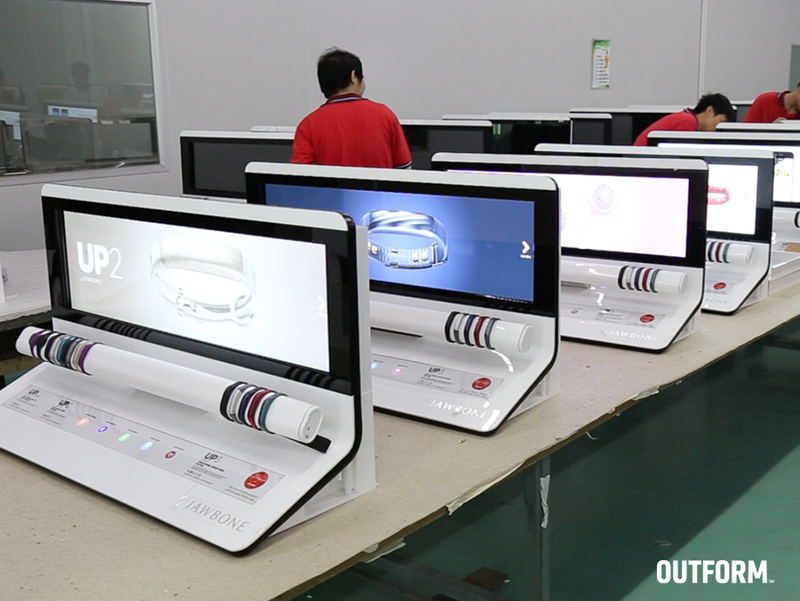 Outform was able to successfully create promotion and awareness of the Jawbone brand with the UP display. 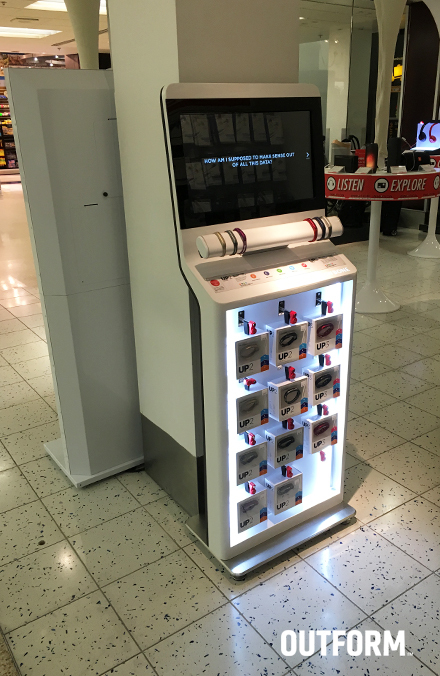 We also created an engagement through an interactive in-store experience for customers. 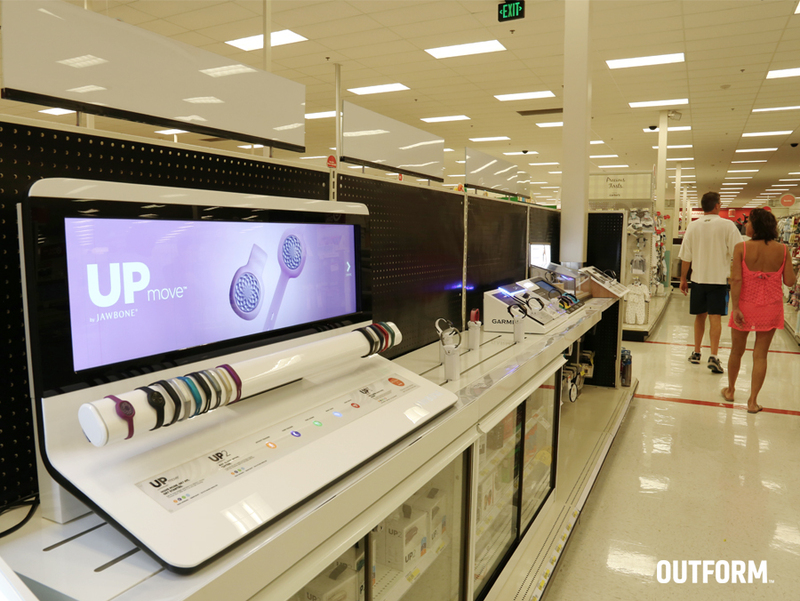 Lastly, the display created not only shopper consideration for the UP by Jawbone, but also persuaded shoppers’ purchase decisions into buying the UP by Jawbone fitness tracker. 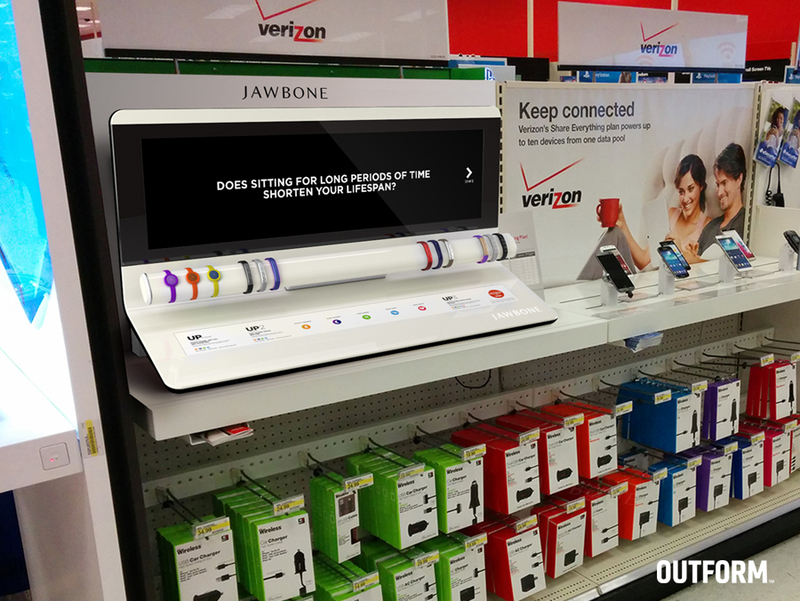 Learn more about the UP by Jawbone Shopper Engagement Display here.